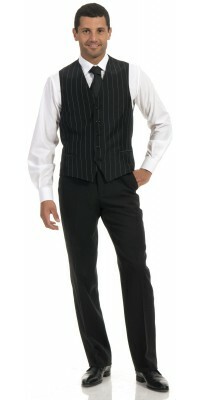 Vest Pinstripe There are 6 products. 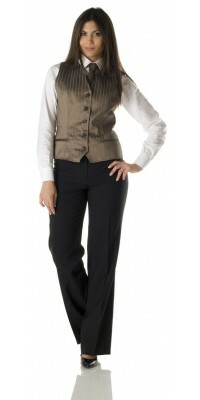 Corbara Professional Wear: the timeless elegance of Waiter Vests and Barman Vests. 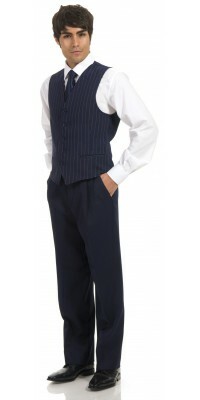 From the typical and refined pinstripe pattern, suitable for both classic restaurants and modern cafeterias, the Pinstripe Vest on this page is available in two colors: black and blue; both colors are "striped" in pearl grey. 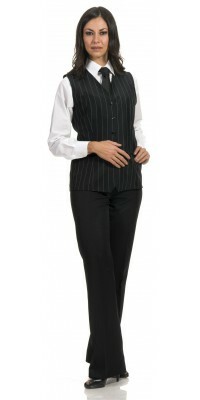 The pinstripe Vest series includes two models: Varsavia, a shorter, male model, and Berna, a longer and feminine model, both are made in the Victory Gabardine wrinkle free, a 100% polyester fabric. The Morocco Striped Vest, are available in two models: the Zurigo for women and Varsavia for men, both are made in the Shiny-Satin Gabardine, a 100% polyester fabric. These vests are refined and elegant garments from the particular glossy fabric and are ideal for hotel restaurants and bars and exclusive clubs. 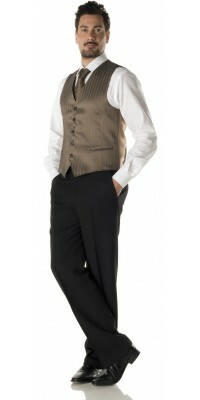 In addition to the vests on this page, the section on Professional Restaurant and Bar attire, also has Solid color Vests. Women's long vest, model BernaLined, back made of the same fabric Black PinstripedImmediately available for delivery: sizes from S to XL Made of Victory Gabardine, 100% Pol. Unisex vest with 5 buttons, model Varsavia Lined, back made in black fabricBlack PinstripedImmediately available for delivery: sizes from S to XL Made of Victory Gabardine, 100% Pol. Women's long vest, model BernaLined, back made of the same fabric Blue PinstripedImmediately available for delivery: sizes from S to XL Made of Victory Gabardine, 100% Pol. Unisex vest with 5 buttons, model Varsavia Lined, back made in navy blue fabricBlue PinstripedImmediately available for delivery: sizes from S to XL Made of Victory Gabardine, 100% Pol.